The Jagdpanther is a German tier 7 tank destroyer. El desarrollo de este cazacarros, basado en el chasis del nuevo carro VK 30.02 (MAN) comenzó en 1942. En octubre de 1943 comenzaron las pruebas del prototipo. Se fabricaron un total de 392 vehículos. 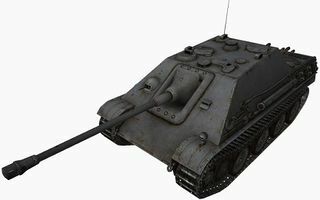 The Jagdpanther, along with most lower tier German tank destroyers, boasts an accurate gun, high mobility, and decent armor. 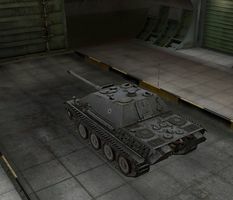 It has similar speed and the same armor of the Panther, and, with the hitting power of the 10,5cm Pak 45 L/52, is able to pose a threat to all tanks. The Jagdpanther leads to the Jagdpanther II, and the Ferdinand. 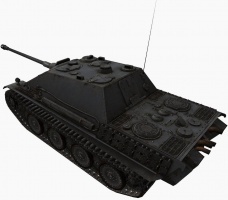 The Jagdpanther is a very good TD and, mounted with the 105mm gun, presents a serious threat to all enemies. It has no obvious weak points, aside from the usual downsides of turretless TDs (weak side armor, quite helpless if detracked, and so on), but its large profile means you will have a hard time hiding it properly. The highly sloped armor is still very thin, so distance combat is desired. Avoid fighting up close. 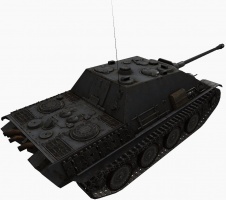 The Jagdpanther can be used as an assault gun, but only in a pinch. The Jagdpanther works well as a stationary sniper at long range, as long as it is not spotted. In urban maps, make use of long alleys and streets. The playstyle depends on the gun equipped. With the 88mm, this TD is an amazing sniper, combining German accuracy with a high DPM, although the alpha damage is lower. Shell costs with this gun are five times lower as well, making misses less costly. 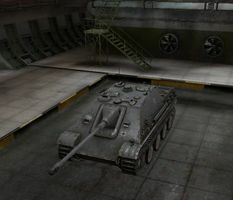 Equipped with the top engine and 105mm gun, however, this TD can still be played as a sniper, but also able to brawl and out-DPM the enemy if necessary. Generally, you want to stay as close to the front as you can, without being spotted. Preserve your hitpoints until mid- or lategame, and trade health/brawl in favorable conditions afterwards. If you have the FuG 12 researched from another line, equip it. Otherwise equip the FuG 7 from the Jagdpanzer IV. The Maybach HL 230 TRM P30 carries over from the German medium line. However, it cannot be equipped on the stock suspension with the 8,8cm Pak 36 L/71. Since it only adds 50hp, and the penetration and damage of the 8,8cm Pak 36 L/71 is necessary over the earlier guns, it is advised to leave it off until after the upgraded suspension is researched. Research the 8,8cm Pak 43 L/71, as the 8,8cm Pak 36 L/56 lacks penetration and the 7,5cm Pak 42 L/70 lacks damage. This can be equipped on the stock suspension as long as the stock engine is used. Research the suspension next. Equip the Maybach HL 230 TRM P30 if it has been researched in another line. Research the 10,5cm Pak 45 L/52. Research the Maybach HL 230 TRM P30. Research the Ferdinand or the Jagdpanther II in either order. 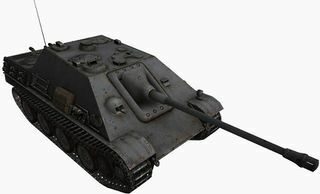 A heavy tank-destroyer design based on the 8.8 cm Pak 43 gun and the Panther tank chassis was ordered in late 1942 as design SdKfz 173. Production started in January 1944. In February, Hitler specified the Jagdpanther name. To accommodate the heavier-caliber gun, much as on previous Jagdpanzer-style unturreted tank-destroyers, the glacis plate and sides of the Jagdpanther were extended up into an integral, turretless fixed-casemate as part of the main hull itself to provide a roomy interior. The Jagdpanther had side armor of increased thickness to offset the slightly reduced angle of the side armor necessary to provide enough interior space. The new (April 1944) Panther Ausf. G had the same feature, to harmonize production and increase protection. It was armed with an anti-tank version of the same long-barreled 8.8 cm gun as the Tiger II "King Tiger" and a single 7.92 mm MG-34 machine gun in the front glacis plate for local defence. The Jagdpanther had a good power-to-weight ratio and a powerful main gun, which enabled it to destroy any type of Allied tank. 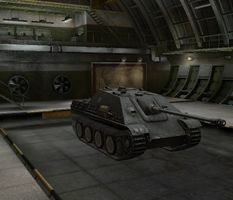 Based on the existing Panther chassis, the vehicle did not suffer too many mechanical problems: it had an upgraded transmission and final drive to counter the Panther's main weakness. It was manned by a crew of 5; a driver, radio-operator, commander, gunner, and loader. Two main variants can be distinguished; the earlier (1944 model) G1 with a small internally-bolted main gun mantlet and a modified Panther A engine deck, and the later (1945 model) G2 with a larger, outside-bolted mantlet and a modified Panther G engine deck, though late G1s also had the larger mantlet. Early Jagdpanthers had two vision openings for the driver, whereas late versions had only one. The main gun originally had a monobloc gun barrel, but later versions were equipped with the Pak 43/4 gun with a 2-part barrel. Early G1s (to September 1944) were coated with the distinctive resin paste 'zimmerit' in a distinctive 'small-squared' pattern. A total of 415 Jagdpanthers were produced from January 1944 by three manufacturers. MIAG produced 270 from January 1944 until the end. Maschinenfabrik Niedersachsen-Hannover (MNH) produced 112 from November 1944. Maschinenbau und Bahnbedarf (MBA) produced 37 vehicles from December 1944. They equipped heavy anti-tank battalions and served mainly on the Eastern Front, although significant numbers were concentrated in the west for the Ardennes Offensive. They were first encountered in the west in very small numbers late in the Battle of Normandy, where the German 654 schwere Panzerjäger-Abteilung ("654th Heavy Antitank Battalion") deployed about 12 Jagdpanthers against British units. The Jagdpanther's only primary armament was the 8,8 cm Pak 43 L/71. No historical records exist of any other armament being developed to replace it. From February 1943, all German armored vehicles received a dark yellow undercoat. The base colour was changed to dark green in November 1944. 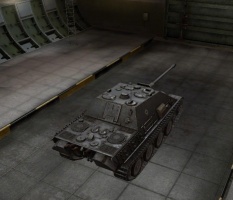 In World of Tanks, however, the Jagdpanther is painted in panzer gray. Actual top speed is 46 km/h (currently 55 km/h).